The vegan diet based on the consumption of fruits and vegetables has a high nutritional value. Part of their benefits, and respect for animals and the environment, are based on the antioxidant power of exclusive consumption of large amounts of natural products. This is associated with a healthy life and reduces the risk of cancer, the chances of having heart problems and, with good planning it can cover all the dietary needs of a normal person. On the other hand, the vegan diet prevents fat consumption and increases of the cholesterol level because the diet doesn't include any products from animal origin. One of the foods that can be included in a vegan diet are tigernuts. Its scientific name is yellow nutsedge and its consumption increases the welfare of people and promotes a healthier lifestyle. 1. The University of Valencia, one of the places where the tigernuts are grown, said that the tuberis rich in minerals (phosphorus, magnesium, calcium, iron and magnesium). In addition, it is low in sodium, so it can be suitable for hypertension. Tiger nuts also have many proteins which makes them a very powerful food and nutritional energy type. 2. They are high in oleic acid rich in Omega 9, similar to olive oil or hazelnuts and they can help lower cholesterol and triglycerides levels, one of the biggest concerns of the world population. 3. In Spain it's very common to consume tigernuts in a famous drink called horchata. This milk does not contain fructose and lactose and can be consumed by diabetics if there is no sugar added. The horchata is favorable for them as it has properties that increase insulin production. 4. Tigernuts provide more iron than the same amount of cow milk. Therefore it's excellent for people prone to anemia and as a tonic. 5. Its starch content make it a natural antidiarrheal and it has a positive impact on the digestive processes because it has two types of enzymes that overcome bloating and flatulence. Furthermore, it is easily assimilated and therefore is recommended for people individuals with gastritis or stomach aches. And if that were not enough, it acts as a prebiotic in the intestine. 6. It contains arginine which assures an improvement in the immune system. Regular consumption affects immunity, protecting the body from disease. 7. 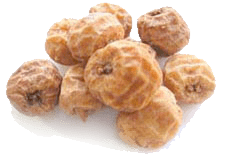 The tiger nut contains zinc and therefore acts as a very effective stimulant in moments of fatigue or tiredness. Including tigernuts in the vegan diet is an idea full of health benefits.